Where we live, we're surrounded by halal butchers. You can get pretty much anything you want, from chicken to lamb and beef, with handful of shops offering duck, rabbit or even venison. The guys behind Halalnivore are self-proclaimed foodies, who weren't satisfied with the quality of meat available at the local butchers. They invested a lot of time and effort into researching the best quality halal meat suppliers, to create gourmet meat club that delivers the best cuts straight to your door. I met the guys a few months ago at the London Halal Food Festival - they are such a friendly and enthusiastic team! Although I remember actually being more interested in their new range of meat rubs, while Hubby was discussing the meat 😉 A while ago they kindly offered to send us their Starter Box to try out. They call it "the ultimate box to get you started on your gourmet meat journey". If you place your order by 12pm on Tuesday, you'll get your selected box on Thursday. The box is delivered by the courier straight to your door. The meat is fresh, never frozen (although this only applies to the cuts, burgers might arrive frozen), and with the way it's packed it can stay fresh for up to 48 hours - once you have it delivered it's suitable for freezing. The starter box contains succulent beef steaks: 2 x 8oz Irish rump steaks and 2 x 8oz Brazilian rib eye steaks, as well as juicy 6oz Angus Beef burgers and 5oz Lamb kofte burgers (packs of 5). I must admit - I've always been slightly scared of cooking steak. 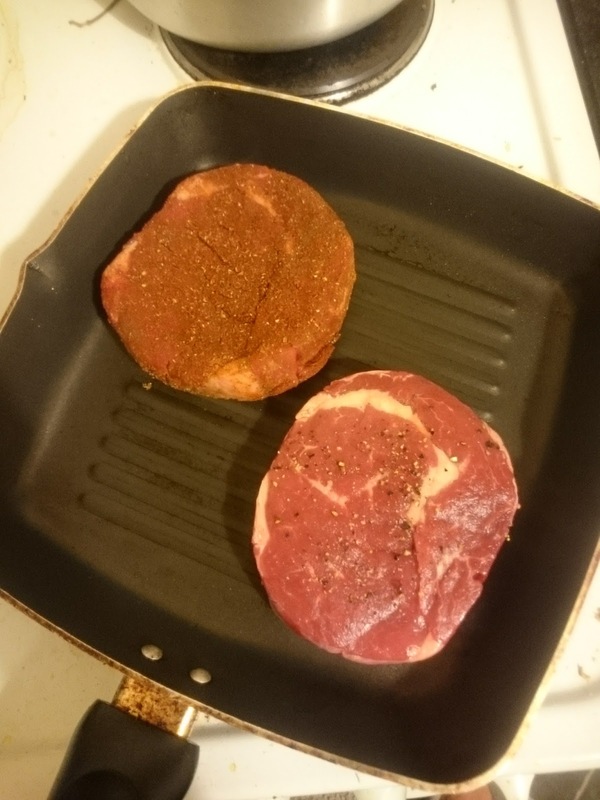 In all honesty, I'm not really a big fan of red meat - I could probably happily go through life only eating chicken 😁So I've never actually cooked a steak before, and wasn't sure if I can get it right. But Halalnivore though about the beginners too - in the box I found a little guide to cooking the perfect steak, and by following that I cooked my rib eye to a perfect medium, just as I wanted! Braving the steaks! I marinated Hubby's one in some spices, and mine just had some black pepper on it. And, although I said I'm not really into red meat, I'm partial to a good burger. Sadly, it's hard to get a decent one where we live - there are maybe a couple of places that serve tasty halal burgers. And what's available at the shops isn't that exciting too. But oh my, the Angus Beef burgers. Honestly the best I've eaten in a long time! And I even enjoyed the lamb burgers! I absolutely hate lamb, and will only eat it if we go to someone's house and that's what's on offer, but the Halalnivore kofte burgers have so much flavour from the spices, that I found them quite pleasant. Haalnivore offers great deals for all the lovers of good quality meat. You can choose from set boxes that include a selection of best cuts, or you can browse the Halalnivore website, select your favourite cuts and/or burgers and they will make that into a box for you. The boxes start at £39 for the Starter Box we've been trying, with free delivery over £80 (and just £4.50 if you spend over £25). We found the box to be quite a good value for money, especially when you consider the fact that all the meat was fresh and carefully sourced for best quality, so it equals the standard you get in the best restaurants! *The above post was written in collaboration with 'Halalnivore', who kindly sent us their products for the purpose of the review. All presented opinions are my own. Fajny wpis :) Wesołych Świąt !